Hey, even if you are a poor kayaker, at least you don’t have to sound like one. Impress your girlfriend (or boyfriend) by creating the impression that you know what you are talking about! 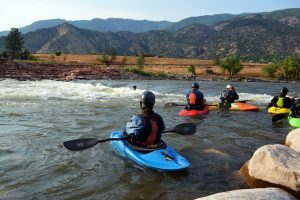 Brush up on your playboater lingo and diction and be the armchair rodeo star on the banks of the Glenwood Springs Whitewater Park. Blunt- The staple of a wave rider’s repertoire. A vertical carving turn performed on the face of steep wave. Really good blunts can find you several feet in the air. Boof- Paddling briskly (and with well-timed technique) to skip off a steep drop and launch you (hopefully) past the ensuing hydraulic at its bottom. A vigorous chunder (see subsequent entry) awaits should you fail at proper execution. Cartwheel- Whee! Vertical or near vertical rotations until you puke! How many can you tolerate? This self-explanatory maneuver barely even nets points in today’s modern scoring system. Also known as “throwing ends”. Chunder- Ever been jealous of your Sunday laundry? Powerful river hydraulics can give you that spin-cycle experience you always been curious about. Flat spin- can you say old school? While definetely not as ancient as the pirouette or the ender, this trick is definitely yesterday’s news. Still good fun, and well-worth mastering to spice up any bag of tricks. Gaper- c’mon we all know one of these. A gaper is anybody who calls a loop a “flip” or has a $429 AT bent shaft paddle but holds it upside down. Also, anybody that yells from the bank, “How ‘bout a roll squirt?” certainly deserves this prestigious designation. Helix- Inverted, fully aerial, 360-degree retentive rotation. Invented by Steve Fischer on the giant-water waves of Africa’s Zambezi River. Longhaired, freaky gapers need not apply. Loop- Fully aerial front flip initiated by driving your bow into the green water of a steep hole and throwing your weight aggresively forward as you rocket upward. Impressive, but does not carry the clout that it once did. Comes in “front” and “back” varieties. Lunar Orbit- Sputnik did not orbit the moon but you can upon mastery of this Eric Jackson invented maneuver. Spinning, crossgrain, cartwheel-flip might describe it best. McNasty- Another in the crowd of cutting edge tricks guaranteed to receive “ooos” from the crowd if performed correctly. Switch stern blast 360 into front loop combination. Phonics Monkey- A rare species of river monkey (Lophocebus Kayakus) that lives along rivers and streams in Colorado and other paddle-friendly states. Prefers to live on or near local whitewater parks or surf holes of other varieties. Okay, okay. It’s actually a retentive crossbow-initiated pirouette into a front loop. (If you see anyone actually perform one, they deserve a good pat on the back). Retentive- A hole or wave that is sticky enough to allow for multiple tricks per ride. (related entry: overly-retentive). Sic- Not certain how this term came into being. Scholars maintain the etymology was lost centuries ago. Loosely interchangeable with the words “awesome” or perhaps “amazing”. Side surf- Surfing sideways. Did you really need someone to explain that to you? Space Godzilla- Its okay, don’t panic. This term has nothing to do with early-90’s Japanese film. The space Godzilla is a trick normally (at least by me) performed on accident when a poorly executed loop goes wrong. Seriously though, this is a legitimate trick. Sort of an aerial cartwheelish, flippy thing with a twist. Sticky- Ever accidentally coated your fingertips with aquaseal while trying to repair that pesky drysuit gasket? Imagine a river wave with giant, gnarled fingers, coated in aquaseal (or sometimes superglue) and those fingers are securely fixed around you and your kayak. At higher levels of this designation, zealous prayer might be your only hope for escape. Unintendo- The unintentional performance of a spectacular rodeo maneuver (or if you’re really unlucky: multiple maneuvers) in a sticky (see previous entry) hole, only to roll up and find yourself still caught in the guilty hydraulics’s grasp.